OFFICIAL PROGRAMME - PRICE 3d. The Dulwich Hamlet Football Club deem it a great pleasure and privilege to accept the invitation of the Isthmian League to stage their representative match with the Caribbean XI this evening. We extend a most cordial welcome to the officials and players of the British Caribbean Football Association and the Isthmian League. This ground will be familiar to the Isthmian League players, all of whom have played here many times for their Clubs and they will be well known to the spectators. We hope the team will quickly settle down, give a display of the high class football of which we know they are capable, and thoroughly enjoy the game. For the Caribbean XI, playing at Champion Hill will be a new experience. We hope they will find the ground to their liking, that, they will have a very enjoyable game and take away nothing but happy and pleasant memories of their visit to Dulwich. We also extend a warm welcome to Mr. J. W. Bowers, Chairman of the F.A. Amateur International Selection Committee, who is with us this evening; also Mr. Norman Creek, who is in charge of F.A. Amateur Teams. The Isthmian League was founded in 1905, and for two seasons consisted of six clubs, London Caledonians, Clapton, Casuals, Civil Service, Ealing and Ilford. Then came the "split" and Casuals, Civil Service and Ealing joined the newly formed A.F.A. Their places were taken by Oxford City, West Norwood and Dulwich Hamlet. The League now consists of 16 Clubs, and is, undoubtedly, a very strong combination. Its growth and success must always be linked with the late Henry J. Husband, J.P., who was one if its founders, was Hon. Secretary and Treasurer 1905-35, President and Life-member 1935-52, and Chairman from 1946-1952. Other well known names in Amateur Football who were connected with the Isthmian League were Sir Arthur Holmes, K.B.E., Vice-Chairman 1926-46; the late Andrew T. Ralston, Vice-Chairman 1926-35 and Honorary Secretary and Treasurer 1935-49, and Sir Stanley Rous, C.B.E., J.P., the Secretary of the Football Assocation, who was Hon. Referees and Fixture Secretary 1926-34. The present Officials are: President, Max Woosnam; Chairman, S. A. Donaldson (F.A. and London F.A. ); Vice-Chairman, G. W. Drane (London F.A. ); Hon. Sec. and Treasurer, D. W. MacKenzie, and Hon. Referees and Fixture Secretary, A. W. Peacock, Hon. Assistant Referees and Fixture Secretary, R. C. Davies. The Hon. Secretaries of the member Club form the Council. Since 1912 the Isthmian League has played 213 representative games, of which 122 have been won, 25 drawn, and 66 lost. Reserves for Isthmian League: J. Wright (Wimbledon) and R. Brown (Dulwich Hamlet). Team Manager: Mr. J. W. Lewis (Walthamstow Avenue). Team Attendant: Mr. W. Jenkins (Walthamstow Avenue). The British Caribbean Football Association was inaugurated in 1957, in Kingston, Jamaica, and the two gentlemen mainly responsible for this are with us today. They are Mr. Eric R. James, M.B.E., who is Manager of the Caribbean party and Mr. A. George Abrahams, who is Assistant Manager. They have with them a Trainer-Coach and twenty-one players. Eric R. James, M.B.E. (Manager) has been Hon. Sec./Treasurer of Trinidad F.A. since 1942. Has organised tours to at least eight different countries. He has won a legendary reputation as a Sports organiser. The climax of his work is the organisation of this Tour. He was founder and first Hon. Sec. Treasurer of the British Caribbean F.A. He is Chief Accountant of Trinidad Government Railway. A. George Abrahams (Assistant Manager) is Assistant Secretary—Ministry of Development—Government of Jamaica. He is Asst. Sec. of Jamaica F.A., a founder of British Caribbean F.A. and was responsible for the final arrangements of this Tour. Noel C. Pouchet (Trainer-Coach)—Played for Notre Dame F.C. in Trinidad. Member of Port of Spain League and Trinidad F.A. An excellent coach and guide, philosopher and friend to the players. Tyrone C. de la Bastide (Full-back)—Born in Trinidad, 10 st. 6 lbs., 5 ft. 4½ ins. age 21. Played for Trinidad 1959—fast and a hard tackler. Leonard Leggard (Outside-right)—Trinidad—5 ft. 4½ ins., age 29—played for Trinidad 1959—first tour. Sydney A. Bartlett (Inside-forward)—not yet 21—represented Jamaica 1958 and 1959. Anthony G. Hill (Inside-forward or centre)—Age 21, 5ft. 10½ ins., 8 st. 6 lbs.—has visited U.S.A. and is now a student in England—has represented Jamaica. 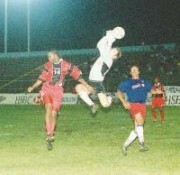 Rawlins A. Baptiste (Goalkeeper)—Very agile although he scales 14 stone 10 lbs.—has represented Trinidad—fine anticipation. Alan O. Parker (Outside-left or centre)—Age 27—played for Jamaica 1958 against an F.A. XI—good shot with both feet. Carl A. L. Largie (Half-back)—Age 31—first represented Jamaica in 1950—very experienced player. Kenneth O. East (Centre-forward)—Age 30—represented Jamaica—expected to score many goals. Walter G. Chevannes (Full-back)—5 ft. 7 ins., age 27—clever although rather short for a full-back—represented Jamaica. Patrick E. Gomez (Goalkeeper and Captain)—Age 29, 5 ft. 9 ins., 11 st. 9 lbs.—toured Britain with Trinidad team—very experienced player. Ronald J. Gray (Inside-forward)—Born in England, age 20, 5 ft. 8½ ins.—lives in Trinidad—dangerous in area with both head and feet. Edward K. Aleong (Half-back)—Age 22—represented Trinidad—good ball player—has balance and poise. Noel A. Daniel (Centre-half)—6 ft. 1 in.—represented Trinidad v. F.A. XI—11 st. 11 lbs.—very efficient player. Alvin A. Corneal (Inside or outside-left)—Age 22, 5 ft. 8 ins., 11 st. 1 lb.—played for Trinidad 1959—first Tour abroad—also good all-round cricketer. William V. Rodriguez (Back or centre-half)—Age 25—played for Trinidad—a cultured player—5 ft. 10½ ins., 11 st. 11 lbs.—represented West Indies at cricket both in India and Pakistan. Doyle Griffiths (Left-half)—Age 27, 5 ft. 8 ins.—represented Trinidad first in 1950—played in England on Tour—tireless half. Compton Julian (Inside-left)—Plays for Georgetown Y.M.C.A.—also for British Guiana. George Green (Right-half)—Started his career 1957 and played for British Guiana 1959. Montague Home (Centre-half)—Can play wing half—capped for British Guiana four times. Hubert Braithwaite (Left-back or half)—Sound tackler—played 12 times for British Guiana since 1950—6 ft.
Reginald Haynes (Right-wing)—Age 28—represented Barbados first in 1953—again in 1954, 1957 and 1958—excellent ball control.